How to Resolve "Error! UAN Password not Available." EPF members can use their 12 digit UAN number for various online facilities of EPF such as online PF transfer, online PF withdrawal and to view their PF passbook at passbook.epfindia.gov.in website. But for some employees whenever they are trying to login with their UAN number and password then they are getting this error that “Error! UAN Password not Available.” sometimes the same error will appear like this “invalid UAN or password in member passbook facility. ” Here is the solution for UAN password not available error in PF passbook. The main reason for the error! UAN password not available problem is incorrect UAN number or incorrect password. Whenever an employee enters a wrong UAN number or wrong UAN password then will see this error. If you forgot your UAN number then you need find it and enter the correct one, or if you forgot the password then you need to correct your UAN password at UAN member portal by clicking on forgot password option. We have to use the same password for both the UAN member portal and the passbook download portal. But there is no provision to correct your UAN at passbook.epfindia.gov.in. Whenever you get UAN password not available error then the first thing you need to check is whether your UAN number and password are correct or not. To check your UAN details goto UAN member portal and enter your UAN number and password, if you are able to log in successfully then your UAN and password are correct, but if you are not able to log in then you have to check your UAN first. You can check it on your payslip or by asking your employer. Once your UAN is correct then you need to correct your password by clicking on forgot password option. Step 1:- To correct your UAN password go to UAN member portal and in home page click on forgot password option. Step 2:- Now enter your UAN number and captcha and click on submit, now a new page will open and it asks you to send the OTP to the registered mobile number in PF. Now click on yes. Step 3:- Now a One-time password will be sent to your registered mobile number, now enter that OTP and click on verify. Step 4:- Now enter your new password Twice and click on submit, now you can log in to UAN member portal and view your passbook at passbook.india.gov.in website. 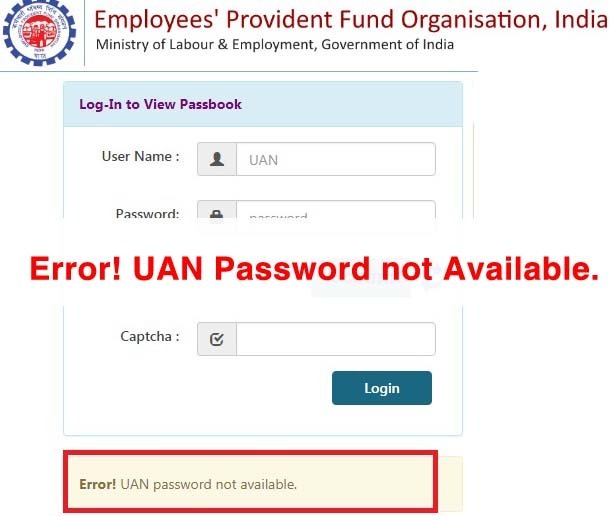 But in very rare cases even though the details present in PF member portal and passbook download site are same, still some EPF members will get this UAN password not available error, they can solve this issue by using Umang mobile application. Now we will see how to solve Error! UAN password not available problem in Umang. 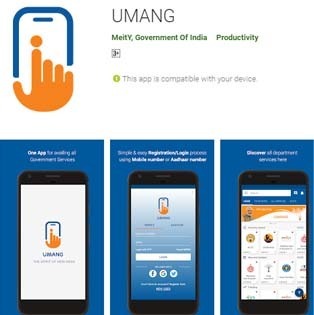 Umang is a mobile application available for Android, Windows and IOS platforms, it was launched by the Indian government. By using the Umang app the citizens of India can avail various online facilities related to various govt schemes. If you haven’t downloaded Umang app till now then first download this application. Step 1:- Download Umang mobile application from the Google play store. Step 2:- Now login with your registered mobile number. Step 3:- Once you login then you redirected to a page where you can see all the govt scheme services available in Umang. Now click on EPFO. Step 4:- Now click on employee-centric services. Step 5:- Now click on view passbook option. Step 6:- Now enter your UAN number and click on get OTP option, now a One time password will be sent to your EPF registered mobile number. Step 8:- Now your PF member Id i.e PF account number will appear. If you have multiple PF member Ids linked to one UAN then you can see all those PF member IDs. Now click on PF member id for which you want to download your PF passbook. Step 9:- Now you can see your PF passbook and if you want to download it then you can download it into your mobile. Note: Sometimes you may face some technical issues with Umang app, in that case, wait for 24 hours then again try. So the above are the Two ways to solve Error! UAN Password not Available problem. Any of the above methods will solve your problem. But in most cases having a correct UAN number and password will easily solve this issue. If you are not able to find a solution to this problem then you can ask your queries in below comments section.